The beauty of the Fringe is to see an array of performances that you wouldn’t see throughout the year. 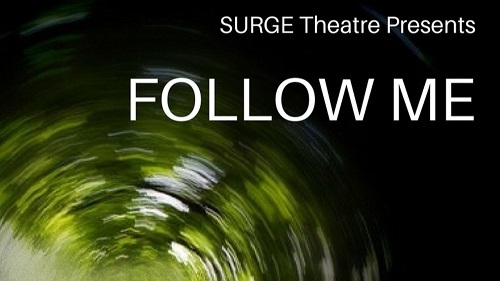 It’s that level of risking taking that is essential to the festival, and SURGE Theatre with FOLLOW ME fully encapsulate this idea. Alexi Pedneault, Stefan Till, Elizabeth Staples, and Lisa Alves utilize this long, enclosed piece of red yarn that is the predominant feature of the show. On a bare stage, it shapes the playing space and controls the majority of the movement done between the ensemble. It’s pleasing to watch this potential nightmare of a prop to be handled effortlessly by all cast members. It creates a great back and forth of the power shifts between the actors. We are encouraged to follow the ensemble, but there are moments that lose touch and feel lost. There are notes that hone in on the human experience with body issues and crushing anxiety, but there’s a disconnect from the emotional focus that these topics require. Moments in between the exchanges of the rope are sometimes distracting. These transitions and set-ups of the rope draw away from some intensity of the topics being spoken. Also, an invitation for audience participation is engaged and dropped as soon as it’s introduced. It creates pacing issues, especially being right at the tail-end of the performance where we are expecting to follow through with it, but nothing major comes out of it. FOLLOW ME has potential in being a raw emotional piece of theatre. The physicality is on point and the ensemble is pulling off some great risks. Stringing out some of the intention will for sure make this a well-rounded theatre experience.